Being gluten free in San Francisco means access to an abundance of local artisanal food producers who’s gourmet goods are easily purchased at many of the Bay Area Farmers Markets and high-end grocery stores. The Ferry Building Farmer’s Market and Plaza houses an enormous selection of gorgeous produce and gourmet eats. Highlighted above are a few items I brought home with me last week. Combined, the ingredients make a great vegetarian lunch or snack. Simply toast the bagel, spread on fromage blanc and top with the apple fennel kraut. Cowgirl Creamery: Artisan cheeses made locally. A beautiful display at their Ferry Building location gives you lots to choose from. Farmhouse Culture: Local and organic vegetables cultured and seasoned with fantastic flavors. Find them at the Ferry Building on Thursday and Saturday and other bay area farmers markets. I love their seasonal apple fennel kraut, available fall-spring. Mariposa Bakery: the go-to bakery in the Bay Area for everything gluten-free. With two locations (one at ferry building), and products sold at local grocery stores, their baked goods are readily accessible to the region. Find everything bagels baked fresh daily at their Oakland location. 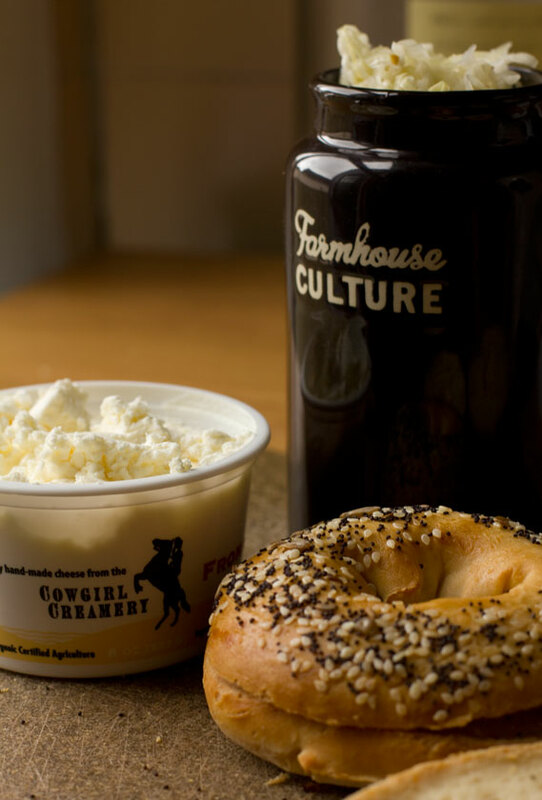 Loooove Farmhouse and Cowgirl Creamery.